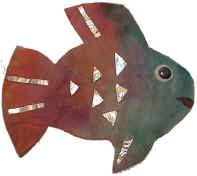 Tip from Val: To make the Rainbow Fish Crafts look underwater, stick it to a blue sheet of construction paper and glue on top one sheet of slightly crumpled cling wrap. For an alternate idea see Sarah's suggestion. Flatten out coffee filter on a plate. 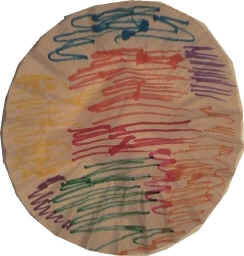 Color roughly with various colors of markers - this is wonderful as even the youngest children can color this way. 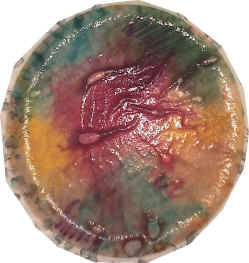 Wet coffee filter (using a squirt bottle or by flicking drops of water onto the filter with your hands). Once dry, cut out a fish shape from the coffee filter (we always save the scraps as they substitute well for any tissue paper projects we might make at a later date). Glue on some small strips and triangles of tinfoil. Glue on a wiggly eye and draw on a mouth.